Unlike reinforced concrete ground beams, the RCR provides a finished floor structure as well as supporting the external and internal walls. These are mainly used when constructing a new garage or conservatory base. RCR is a quick and effective alternative to digging deep trenches to construct traditional strip footings. Covering a large surface area the RCR can enable piles to be installed in random positions to accommodate the shape of existing structures and where required to avoid any underground services or tree roots. Like reinforced concrete ground beams, RCR can also protect against any possible ground movement by installing approved heave protection. The speed of construction, 90% of the excavation can be achieved by machine leaving only a small amount of hand digging which reduces labour cost. One disadvantage of using RCR is if the existing landscape is uneven or slopes in any direction once cast the sides of the raft will be exposed. 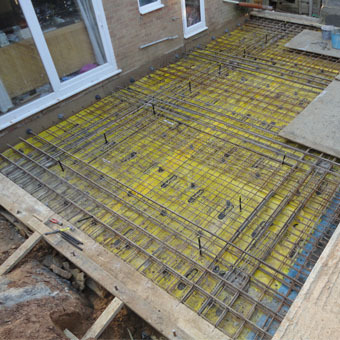 So if you are considering the construction of an RCR, first check the required finish floor level and measure down to the existing outside ground level. If the measurement is over 250mm it would be advisable to opt for reinforced concrete ground beams unless the external ground level can be raised to conceal the edge of the new RCR. For a free consultation or for any help and advice please call today.